Just About Anything: Need Luck? Wear Jade! - have gone through rough relationships. - have made bad decisions in your life. - have lost your temper and lashed out at your little child. - have been a victim of lies and insincerity. - have felt that you didn't have enough to satisfy your material needs. That is why there is BillyTheTree for the real deal! They have a huge selection of 100% Jade jewelry at very reasonable prices. With the season of gift giving fast approaching, this is one great gift idea. You can send it directly to the recipient too as they ship worldwide for FREE! I know someone who needs a little luck and any jade piece will do. 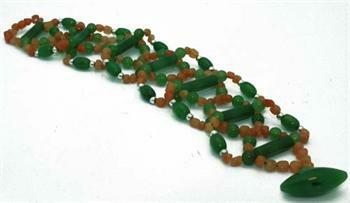 I found the Jade and Carnelian Bead bracelet shown in the photo above from their fine selection of Jade Bracelets and I know they will be perfect. It looks very trendy and chic and I am sure she will like it! With such great design, I would be very happy to wear one myself. So if you feel you are running out of luck, why not wear jade? You have nothing to lose if you believe in good luck and lots to gain.